"He came from a long line of sharecroppers," was one of the terms Bertie Davidson used to describe her father as we talked while sitting on her front porch one Monday afternoon recently. Bertie called to ask if she could share the story of her parents with me sometime, and we arranged for a time to sit and talk. Bertie’s brother, J.B. Harris, was also there to share in this time of remembering. And as the story unfolded, I was more than glad she had called. Bertie’s parents, Luther Harris and Bell (Brown) Harris, were married June 26, 1929, at the home of Jake Shelton on Highland Mountain. Bell was working for the Sheltons at the time she and Luther got acquainted. In exchange for room and board, Bell did housework for the Sheltons, and Luther did work as a sharecropper with farmers in the area. Neighbors and friends of the families attended the wedding. The young couple took up housekeeping in a small one room house on the Shelton property, and by the time the two oldest of the children were born, Luther and Bell had moved to another one room house they rented on property owned by Ben Vaughn. There were two stoves in the Vaughn house, one used for heating, the other for cooking. When Bertie was around the age of five years, the house caught fire and burned to the ground. The only thing saved were some clothes Luther was able to get out by using a pole to reach in the burning house and lift them from off the back of a chair. The Herman Hooten families, who were their neighbors, took them in for a while, and it was Mr. Hooten who got on a wagon one day and drove the entire loop around Highland Mountain gathering things from everyone who lived along the road to give to the Harris family so they might begin housekeeping once more. After losing everything they owned in the fire, a two-room house was built by Lou Oakley at York Gap where the Harris family later moved into. Luther worked for Mr. Oakley, someone all the Harris children knew as Uncle Lou, and his wife was known to them as Aunt Sally. Mr. Oakley, who was a farmer, also had a woodworking shop, and was also kind enough to build some furniture for their house. Bertie remembers a table he built for them, along with a meal chest, and other items he crafted by hand especially for their family. As time went by, a total of ten children was added to the Harris family, but three of the ten died when only a few days’ old. Those children who died were twin boys, Billy C. and Joe L., and a daughter named Audie Mae. The names of the children in the order of their births are: Bertie; M.L. ; L.N. ; Jerry; Billy C and Joe L; Audie Mae; Carrie Lou, J.B., and Bessie Lee. Because of Luther Harris’ work as a sharecropper, he moved his family around quite a bit over the next several years. At one time, the family lived on a farm known as the Millard Harris place on the banks of Roaring River. The house was located in a horse shoe bend of the river, and while they lived there, the river overflowed its banks, and 8 inches of water flooded the house. A bridge that crossed the river nearby was also washed away during this flood. Martin Hooten and his family took the Harris family in and allowed them to stay at their house until they could return to their own home. The Harris children went to school at places called Guinea Hill, Highland school, and Union Academy. Mr. Harris told his children how he didn’t get too far in school because of a story that was in a primer book he saw when he was in school at Oklahona. He told them that in this book there was a picture of a bear holding a man down, and that looking at that picture scared him so badly, he got up and went home. That story ended his education. He never learned to read or write. 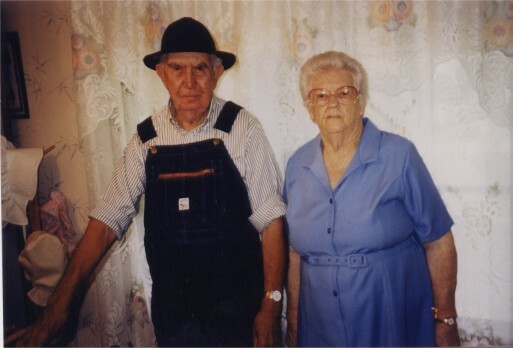 The Harris children helped with the work involved on a farm such as planting crops, pulling fodder, canning vegetables from the garden, and raising hogs. They walked or rode in a wagon everywhere they went. Their clothes were mostly hand-me-downs, but Bertie fondly remembers the very first pair of store-bought dress slippers her father got for her. She was twelve years old at the time. She said she will never forget how proud she was of that pair of shoes. Wash day for Bell Harris always was done on a rub board. Water was heated in an iron kettle in the yard and the clothes were placed in the boiling water. When Bertie was 17 years old, she got a job at the shirt factory in Livingston, and one of the first things she bought her mother was a wringer washing machine. Bell Harris was so happy with this modern invention, which for many months afterward, she invited all her neighbors to come to their house and use her new washing machine. And most all the ladies she invited took her up on this kind offer too. Bertie remembers how some would come and wait their turn to wash in Bell’s wonderful new time saving device, even though the water they used had to be carried about a fourth of a mile to the house. After living many years in several different locations, Luther and Bell and their daughters, Bessie, have shared a home in Monterey for many years now. Bessie purchased the property, and the home was built by her brothers. This home was the first place Luther and Bell has lived that had an indoor bathroom. And it was Bertie again who bought her mother another new and more modern invention. This time it was an automatic washer and a dryer to go with it. Bell’s health is still quite good, but Luther now suffers from Alzheimer’s disease. The family all shares in the responsibility and work involved in the care of their parents. Bessie quit her job working outside the home to help with the care of her mom and dad, but every night, one of the brothers comes to stay so Bessie may rest. Each of the brothers has a regular night to stay. The sisters have certain days they do their share in the caring of their parents. But probably one of the most touching things about Luther and Bell’s lives together is that they have also raised their grandson, Bobby Harris, who is now 46 years old, and still lives with them. Bobby’s story is pretty amazing in itself. He was born with cerebral palsy, but that wasn’t the only thing that he faced as an infant. His mother, the wife of L.N. Harris, died giving birth to him. In order to help their son deal with not only a new baby, but the loss of his wife, Bell and Luther took Bobby to raise and have cared for him ever since. Bertie described Bobby as someone who would not appear to be aware at all of his surroundings, but just the opposite is true. Bobby has never spoken a word, yet he is a very smart young man. At one time, he had a home bound teacher who worked with him, but several years ago, Bobby, with the help of Lowell Allen, has developed a system on a computer whereby he can communicate. Cerebral palsy has left Bobby in a semi-fetal position, so using his hands is not possible. But with the use of a head band that has a rod attached, he types on the computer by moving his head from place to place. Just recently, Bobby has gotten another machine that by knowing where to type, a voice can communicate his needs for him. He loves to help out by doing little things like addressing envelopes. He’s done this quite often for his Aunt Bertie. When it came time to pay monthly bills, Bobby addressed the envelopes she needed to get this job done. But addressing envelopes is just one of the many skills he has developed. 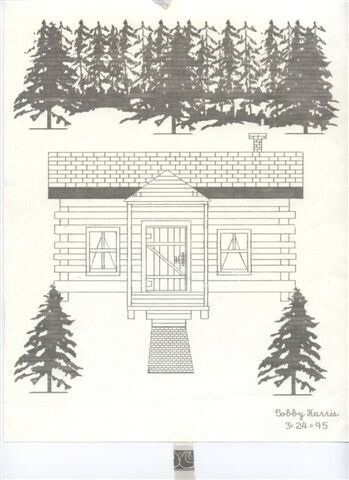 He does blueprints, he designs cabinets, and he does artistic things such as the drawing of a log cabin. The one that is shown with this story was completed in March of 1995, and was given to Bertie’s husband, Lewis. From what Bertie told me, Lewis and Bobby like to pull pranks on each other. Bobby sent a picture to Lewis once he had done on the computer using an actual picture of Lewis, but in that picture he placed a very young and attractive blond from a catalogue by his side. His wonderful sense of humor can be seen in spite of his inability to communicate in what we consider a normal way. Luther Harris will be 99 years old on August 24, 2003, and Bell will be 98 September 7. Mr. Harris still has all his natural teeth, doesn’t need glasses, and does not have a problem hearing well. 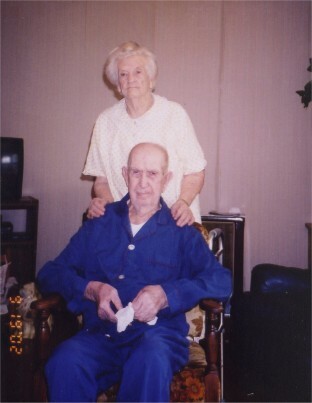 He and Bell have been married 74 years. Most of their lives were lived without having hardly anything we consider as necessities today, but not having material possessions didn’t make a bit of difference in the love and devotion this family seems to be blessed with. The Harris family now includes ten grandchildren, nine great-grandchildren and seven great-great grandchildren whose roots go back to the days of when life consisted of hard work as a sharecropper and one who worked in homes in exchange for room and board. Even though Luther and Bell Harris might not have had worldly riches, they raised a fine family who are completely devoted to their parents and to each other as well. If Bobby could speak to us, I feel sure he would be the first to agree with that. After this story was written, Luther Harris passed away on August 23, 2003. He was one day short of his 99th birthday.